Awarded in August of 1997. 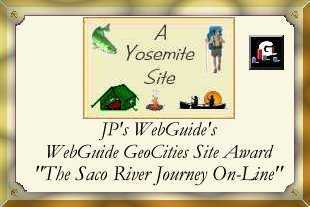 The Community Leaders from Yosemite awarded this prestigious honor in December of 1997. This is truly a great honor to be a member of "The Phenomonal Woman of the Web", awarded in March of 1998. "Awarded June 1998, before becoming a member of this wonderful committee on July 1, 1998." Awarded by an Extradorinary Woman in her own right on June 8, 1998. Stop by and visit Joanne's site! You could be the next "Extraordinary Woman"! Awarded by Captainette on September 1, 1998. Visit her great site! Awarded by Cheryl page on September 2, 1998. Visit her great site and apply for one of her many awards! Send the "River Angel" an e-mail...let me know what you would like to see here, or simply write and say "Hi! ", I'll write you back, honest 'injun! The "River Queen" is also always ready, willing, and able to help you with your Geocities needs! Don't delay, e-mail me today!